Geodesic Shaped Glass Terrarium Container. Beautiful gold brass accent and ventilation. Great for growing micro-greens, succulents, air plants, moss, cacti and more. 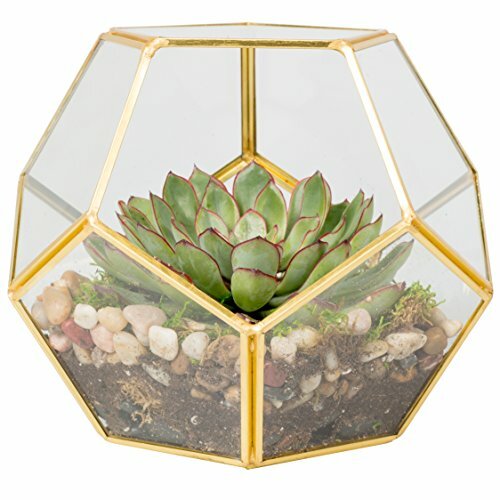 Modern Geodesic Terrariums are a great gift, housewarming gifts, and for small places. 8.2" x 8.2" x 8.2" Take DIY decorating to new heights with terrariums by D'Eco Home Décor. Bring new life to any space, perfect for accenting your coffee table or hanging your mini-oasis outdoors. Create a lush focal point and a great conversation piece to your home or office. Make a statement with this sleek sculptural terrarium in any space indoors or out. 8.2" x 8.2" x 8.2"
If you have any questions about this product by Deco, contact us by completing and submitting the form below. If you are looking for a specif part number, please include it with your message.